Nassau, Bahamas - Police on New Providence are investigating two separate shooting incidents Sunday, 10th February, 2019, which has left two adult males dead. In the first incident, according to reports, shortly after 9:00am, a man was sitting in front of a business establishment on Washington Street and Balfour Avenue, when he was approached by a male armed with a firearm, who shot him, before getting into a silver vehicle and speeding away. Emergency Medical Services Personal were called to the scene, transported the victim to hospital where he later died. In the second incident, according to reports, shortly after 10:00am, a male was standing in front of a business establishment on Robinson Road and Miami Street, when he was approached by a man armed with a firearm, who shot him before running away. Paramedics were called to the scene, attempted to revive the victim, but were unsuccessful. He was pronounced dead at the scene. Police are reporting the discovery of eight (8) marijuana fields in North Andros following a joint operation involving the Drug Enforcement Unit, US Drug Enforcement Agency and officers from the North Andros District, in two separate incidents last week. In the first, according to reports, shortly before 7:00am Thursday, 7th February, 2019, OPBAT Officers, while on air patrols over San Andros, North Andros, uncovered four (4) marijuana fields and with the assistance of Andros Division Officers, uprooted a total of nine thousand, seven hundred (9,700) marijuana plants ranging from 6” to 3’ in height, before destroying the fields with fire. In the second incident, on Friday 8th February, 2019, shortly after 8:00am, Officers from Andros Division, Drug Enforcement Unit and US Drug Enforcement Agency, went to a bushy area in San Andros, North Andros where they uncovered four (4) marijuana fields and uprooted a total of eighty-four thousand, eight hundred and ten (84,810) marijuana plants. These fields were later also destroyed by fire. According to reports, shortly before 10:00am, Friday, 8th February, 2019, Central Division Officers, acting on information went to a vessel at Potters Cay Dock, which had arrived from the island of Exuma, and recovered two boxes, contained 17 packages of suspected marijuana. No arrest was made in these incident. Investigations are ongoing. Police, acting on information recovered two illegal firearms from the streets of New Providence, in two separate incidents, Saturday, 9th February, 2019. 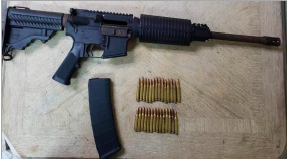 In the first incident, according to reports, shortly after 5:00pm, Drug Enforcement Unit Officers, acting on information, conducted a search of a bushy area on Bonaby Alley off Kemp Road, and recovered a black AR 15 rifle which contained twenty-eight (28) rounds of .223 ammunition. 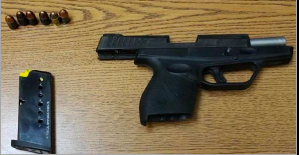 In the second incident, according to reports, shortly after 6:00pm, Drug Enforcement Officers acting on information, conducted a search of an abandon building on Turtle Drive off Carmichael Road and recovered a 9 millimeter pistol and six (6) rounds of ammunition. Police are actively investigating these matters with a view of identifying persons who were in possession of these firearms.